If you are looking for information on the Great Wraps franchise business opportunity, Great Wraps franchises or Great Wraps franchising, then you have come to the right place. 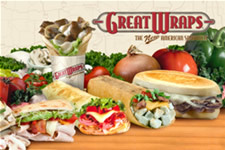 JOIN THE #1 WRAPPED SANDWICH & CHEESE STEAK FRANCHISE! Great Wraps, the #1 Hot Wrapped Sandwich & Cheesesteak Franchise in the Country, is poised for explosive nationwide growth ... and we invite you to join us for the ride. 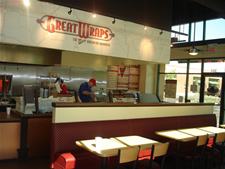 Great Wraps has over 20 years of proven franchise success in shopping centers, mall food courts, business districts, universities and airports, providing you with a fabulous business opportunity. 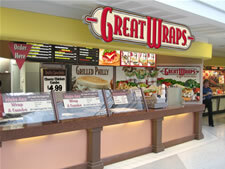 Great Wraps is a concept that's right for the times! That's because customers everywhere are looking for food options that are different, tastier and better than all the boring, unhealthy fast food we all grew up with ... and Great Wraps offers them exactly what they're looking for. Yes, customers simply want something better to eat, and Great Wraps offers you a break-thru concept and a comprehensive business formula to capitalize on this trend. It's a business you'll be proud to own. "I bought a Great Wraps because I think the Concept has unbelievable growth potential." "I looked at countless food franchises, but none were as unique and high-quality as Great Wraps." "I've owned my store for 15 years, and Great Wraps has always provided me with outstanding support. That's why my store continues to churn out volume." Want to know more about this unique US franchise opportunity? We'd be happy to send you more information.